It’s super easy to unlock your Huawei phone. Below are 4 easy steps you need to follow. Your IMEI will be used for us to calculate the unlock code. An unlock code is uniquely assigned to its corresponding IMEI and can’t be used with other IMEI. Your unlock code will be your key to having freedom over your choice of carrier. With UnlockBase you can get your code with a breeze, just follow the instructions and fill in the necessary information. Before you confirm your order you will have to check you follow our Eligibility Requirements. This ensures that you will receive a refund in the event that your phone was not successfully unlocked. These are set of pre-unlock guidelines to ensure your phone will be unlocked successfully. Note: Eligibility Requirements vary per phone model and manufacturer. UnlockBase offers its services to a variety of smartphone brands and its respective models. 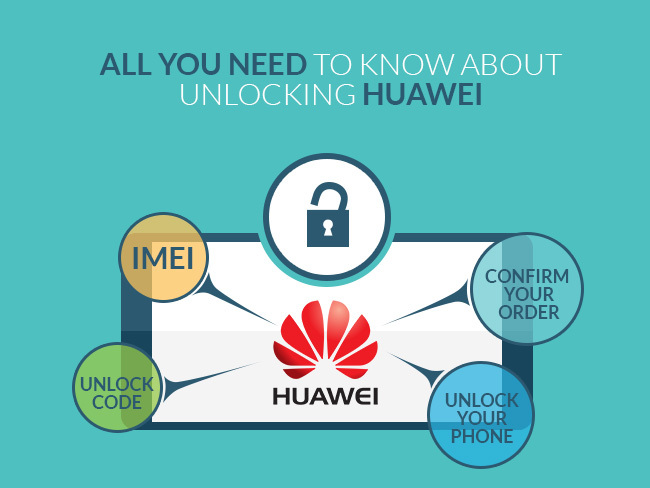 Thus, in order to promote a fast and convenient unlocking service, we use specific services such as the Huawei Calculator, to cater to Huawei’s very own smartphone models. Indeed, Huawei Technologies Co. Ltd, or simply Huawei, has collected various awards for its own set of high-quality, consumer-oriented smartphone best-sellers. 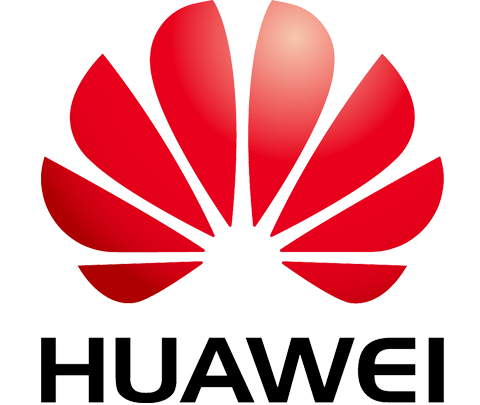 Rooting from the land of Shenzhen, Guangdong, Huawei has been named the largest telecommunications equipment manufacturer around the Globe. This very achievement has helped the company overtake Ericsson in the title way back in the year 2012. Originally, the company was founded by Ren Zhengfei, an ex-military officer in the year 1987. It was initially a company focused on producing phone switches, but has grown into a private company aiming to provide consultation and operational services to enterprise businesses in China and around the Globe in the later years. With its unstoppable progress in the industry, Huawei has landed in three core operating divisions: Telecom Carrier Networks, Enterprise Business, and Devices unit. Primarily, Telecom Carrier Networks unit focuses on building telecommunications networks and services aiming to provide enhanced network solutions to telecommunication companies. The Enterprise Business unit, on the other hand, is designed to provide software, equipment, and services to enterprise businesses in and out of China. An instance of which is government solutions. Moving forward, it also has the Devices unit which is set to manufacturing electronic communications equipment and devices. This includes the smartphones, USB and wireless modems, wireless routers, and video products among others. According to their official site, as of the end of 2015, Huawei has ranked third in the world with regards to phone shipping, which is available in 170 countries, and its products being used by a third of the world’s overall population. It also has 16 Research and Development centers in the United States, Sweden, Germany, India, Russia, and of course, China. Almost unsurprisingly, it has surpassed Apple with regards to sales number in July 2017. Thereby, moving its rank of being the world’s second largest smartphone manufacturer next to the first placer, Samsung. With its success, truly Huawei has more to offer in its 30 years and counting in the industry. Impressively, investing in Research and Development has helped it rise further ahead of its competitors around the world. With that being said, there’s more to look forward to with regards to its high-tech phone technology solutions aside from its best-selling fingerprint sensor and dual-lens camera system. In the event that you plan to unlock your Huawei unit, check out your phone model from the given list above and contact us if you should need further details about our service. We would be glad to provide the fastest, safest, and most convenient unlocking service that you deserve. At the same time, should you need information about our pricing, feel free to visit this page. OK, as you probably noticed, this is not actually a phone, but a portable WiFi router, but it doesn’t make any difference, UnlockBase can still unlock it. 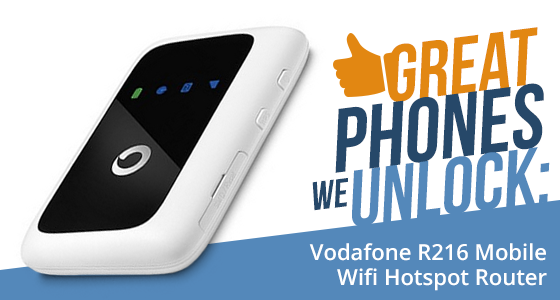 New from leading service provider Vodafone, the R216 Mobile WiFi Hotspot Router is a Huawei made device. It’s a 4G Mobile WiFi hotspot router equipped with the Hisilicon Balong 711 processor. If you visit a Vodafone store and complain of patchy, inconsistent broadband reception at home, or you are visiting the country and need reliable internet access on the go, Vodafone will most likely recommend this product to you. Mobile Wi-Fi provides the most convenient and adaptable way to connect your Wi-Fi enabled devices to the Mobile Broadband network, creating a personal, protected Wi-Fi zone quickly, simply and easily. Ready to use straight from the box, there’s no software to install to get it started, you just switch it on and it’s ready to get you online. With this device you can connect up to five devices at once, making it easy for you and your family or friends to be online at the same time whether you’re using laptops, tablets, games consoles or other Wi-Fi devices such as cameras. And because the R216 is 4G you can use it instead of home broadband. The R216 supports Cat.4 4G LTE with download speeds of up to 150Mbps and upload speeds of up to 50 Mbps. The R216 features LTE FDD 800/1800/2600MHz, UMTS/WCDMA 900/2100MHz and GPRS/GSM 850 / 900 / 1800 / 1900MHz bands. In its DC-HSPA+ network, the device supports download speed to up to 42Mbps and upload speed up to 5.76Mbps. The Vodafone R216 supports WLAN 802.11 a/b/g/n and also dual band WiFi 2.4 + 5 GHz. It comes with an LED indicator and an 1500mAh Li-ion battery. Designed to fit easily in your pocket, it measures 96 × 58 × 12.8 mm and weighs only 95 gms. It comes in a choice of black or white. You can use the R216 Mobile Wifi Hotspot Router to share your secure mobile broadband internet connection with other Wi-Fi-enabled devices, such as computers, Apple® iPhone, iPad or iPod touch, Android smartphones and tablets like the Samsung® Galaxy Tab, or mobile gaming devices such as Nintendo® DSi. There is also flexibility in how you power the device, choose from battery, mains or USB to keep the Vodafone Mobile Wi-Fi working throughout the day. And because it can go wireless after being fully charged, it makes it easier to position your Vodafone Mobile Wi-Fi so as to achieve the best mobile coverage. Apple iPhone/iPad and Google Android tablet/smartphone users can download the Mobile Wi-Fi monitoring app from the respective app stores. If you love the product but don’t want to stick with Vodafone as your service provider no problem. UnlockBase has an easy and affordable solution to unlock the R216. 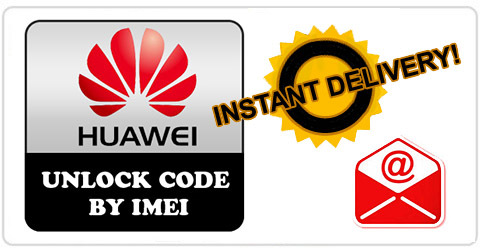 For just $11.90 you can get a Huawei Factory Unlock code. Once you’ve paid, we quickly deliver via email a complete set of unlocking codes as well as the complete instructions on how to use them. Usually you will just need to insert the SIM card in your Device with which you want to use the R216 Mobile Wifi Hotspot Router and the phone will prompt you for the unlock code. And If you find you still need any assistance, UnlockBase has a 24/7 customer support team always on hand to answer any questions you might have and they will respond to you in less than 12 hours. 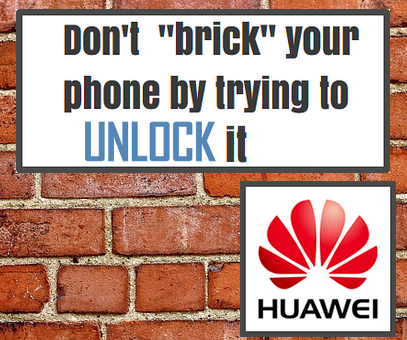 When you try to unlock Huawei using UnlockBase, you may have noticed that recently certain IMEIs from new Huawei cell phone models are frequently returning the message “Not Available” even when you are using the correct Huawei Factory Code. After some investigations we have since found out that these models are using a specific “Calculator” from Huawei and this explains why the Factory Code database is not returning the code. The Calculator has only recently been released and so hopefully we are now able to receive the Unlock Code in less than 3 hours for these Cell Phones. 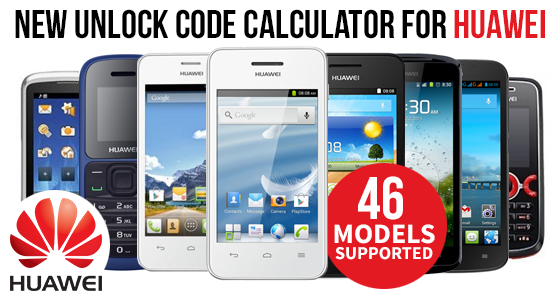 Check out the list below for Huawei Cell Phones supported by the new Unlock Code Calculator. Also check out our competitive prices on our Wholesale Unlock Pricing page. Huawei has a slew of top-of-the-line phones. Take for instance the P7. This finely-crafted phone might not be as powerful and bold as the Samsung S5, but when compared to other phones in its same class and price range, it definitely tops the list. At only 6.5mm thick and weighing only 4.37 ounces, this phone easily fits into your pocket. And don’t forget about the amazing camera and display screen. As grand as the Huawei P7 is, or any other Huawei phone, service on the phones will of course be largely influenced by your carrier. 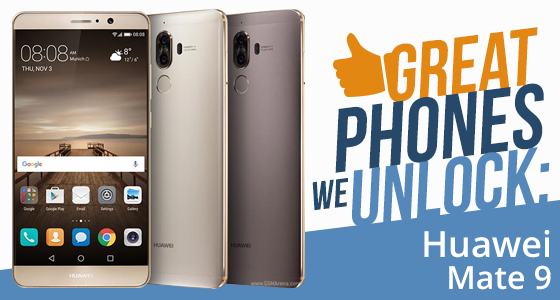 If you have found yourself stuck in a contract that serves the purpose of nothing less than a burden, then take comfort in knowing that you can unlock your Huawei phone and switch carriers. The exact way to go about unlocking your Huawei phone will depend on the model that you have. No matter the model, though, you will need an unlock code. When acquiring this code, make sure it comes from a trustworthy source, or you might end up “bricking” your phone, meaning it will be permanently locked to your current carrier. Also, make sure that you have step-by-step instructions for unlocking your phone according to the model that it is. If you go about unlocking the phone the wrong way, this can lead to a loss of data and files as well as “bricking.” On most models, you will have only three attempts to enter the unlock code. To get an unlock code, you will need to give the source through which you’re acquiring the code and the IMEI number off of your phone. This number is usually found under the battery in the phone. On many Huawei phones, you will need two to four codes altogether (all of which come together when you get an unlock code): Network code, Service provider code, subset Unlock PIN, and/or Counter Unlock code. If at any time throughout the unlocking process your phone displays “simlock block unlock reset key,” then you will enter the Counter Unlock code. Once you have completed the necessary steps involved in unlocking your Huawei phone, you can then use the phone on any compatible network carrier. If you have further questions about unlocking your phone, don’t hesitate to contact UnlockBase today. We are the true source for this Service, so our “Gold Price” is simply the Best you can find ! Please check our pricing on our Wholesale Unlock Pricing page. We just add a new service to Unlock product from Huawei dedicated to “NOT FOUND” (when using regular service). This tool support all Models of Huawei Cellphone or USB Modem and have a much better success rate in case you get an “Unavailable” result when using the other cheaper service we offer for this brand. 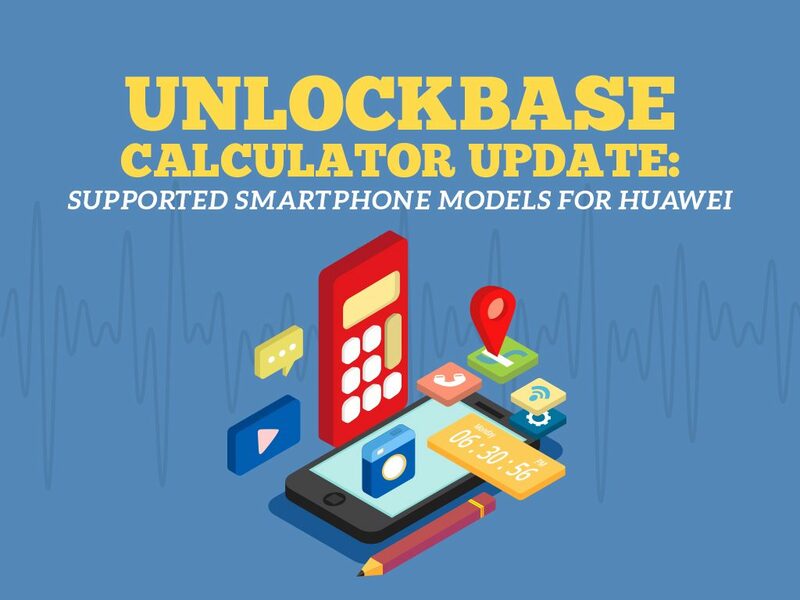 UnlockBase is the Direct Source for Factory Unlocking Code for Huawei and we’re happy to announce that we decide to offer by default our Rock Bottom Price for all our customers. We’re offering now two services [Regular] & [Express], both providing first class service in less than 24 Hours from Monday to Friday. By default deliver All Levels Unlock Code + Reset Key. Now the price is slashed to $1.85 for [Regular] and $2.4 for [Express].